Complete a rustic American bedroom design by adding this one drawer nightstand. Finished in an aged oak color over ash and oak veneers this piece is adorned with an antiqued brass knob. Tapered legs are brought together with one shelf for added storage and functionality. 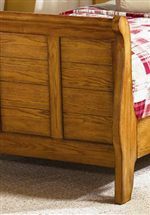 The Grandpa's Cabin Casual Nightstand with One Drawers by Liberty Furniture at Novello Home Furnishings in the Berlin, Barre, Montpelier, VT area. Product availability may vary. Contact us for the most current availability on this product. This bedroom collection is perfect for a rustic American bedroom design. Constructed using select hardwoods and ash and oak veneers this collection carries an aged oak finish. Wood and peg accents are paired with tapered legs and planked construction style to create a cozy room, with options for both adult and youth bedrooms. 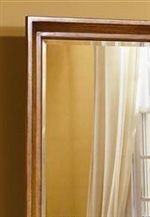 Finishing the casual design are antique looking brass knobs that pair perfectly with the warm wood finish. The Grandpa's Cabin collection is a great option if you are looking for furniture in the Berlin, Barre, Montpelier, VT area. Browse other items in the Grandpa's Cabin collection from Novello Home Furnishings in the Berlin, Barre, Montpelier, VT area.